Luci Shaw (born 1928 in London, England) is a Christian poet. Shaw studied at Wheaton College, Illinois and is now Writer in Residence at Regent College, Vancouver. She lectures on art and spirituality, the Christian imagination, poetry-writing, and journaling as an aid to artistic and spiritual growth. I’ve started reading a book by Piper Kerman, Orange is the New Black; maybe you’ve heard of it. Piper is the typical upper middle class girl. She graduates from college, and unfortunately is attracted to the wrong person — a woman whose life seems exciting and adventurous. turns out her lifestyle is funded by drug money. She invites Piper to travel with her as she manages drug mules and money laundering couriers in exotic places; it’s fun … for a while. Eventually Piper is put into a situation where she crosses the line and delivers a suitcase full of dirty money for her friend. The stress and fear she experiences while committing this act wakes her up to the fact that she’s in over her head, so she flees. She moves, gets a regular job, reconnects with family and eventually is engaged to a nice young man. She’s recovered her “normal” life and nobody is aware of that brief, foolish, lapse in judgement. Okay, I’m finally getting to the point. For years Piper lives with a jail sentence hanging over her. Can you imagine how awful that would be? She knew she had committed a crime and she was going to prison, she just didn’t know when or where. It was a miserable way to live. I could empathize with her pain and terror, trying to lead a normal life, yet knowing the punishment that was waiting for her. But, think about it, without Jesus, wouldn’t we be in the very same situation? Like Piper, we go on living our lives, telling ourselves that our sins don’t have consequences. They’re not big sins anyway. Just the kind of things we fell into without really thinking; things somebody else lured into; things that happened when we were young and inexperienced. We foolishly think we’ll never be called to account. The Bible tells a different story. Judgement is hanging over us and we don’t know when it will come. Most of us, like Piper, would be terrified at the thought of going to prison, even for a short time — so why aren’t we worried about spending eternity separated from God? Piper was humbled before an earthly judge; at some future date, we’ll all bow before the Lord God Almighty! She was pathetically grateful for those who spoke up for her in order to reduce her sentence because she knew what she really deserved — how grateful should we be to Jesus who died to save us from the fate awaiting us? Christmas is a time to rejoice in the good news that our sentence has been commuted, thanks to the God who came as a helpless baby, willing to bear our punishment. We’ve been released from the penalty of sin. We don’t have an eternity of darkness hanging over us. Now we need to live a life that reflects gratitude for that grace. Let’s make a New Year’s resolution to appreciate the gift we’ve received. How are you planning to carry Christmas forward into the New Year? I’d like to hear your thoughts. This is another of my favorite Christmas hymns. I seem to gravitate toward the really old ones. Still waiting to hear from readers and authors about their favorites! “Good Christian Men, Rejoice” is also one of the more older of the carols. This song remains with us today because of two priests who were exiles in their respective times and too radical for their contemporaries. Heinrich Suso was a German nobleman who decided to become a priest during the 14th century. He was a Dominican monk with mystic beliefs that brought him conflict with the church. He was a religious populist who wanted to help the common man understand more about God, this in a time when the church believed that the average person had no interest in theology. After writing a couple of works that were influenced by the teachings of Eckhart, who was condemned as a heretic, Suso was exiled to Switzerland. I hope some of our readers enjoy and are edified by this list, and would like to hear if it is used. 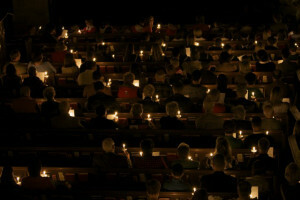 I’d also be interested to hear about whether other churches have held a Christmas Day Service and what was included. It’s Christmas. That should come as no surprise. The traffic around the malls has been backed up for two weeks. Christmas carols have been playing on the radio since Thanksgiving. And stores have been decorated since before Halloween. If anything, we should be saying, “Thank heaven it’s finally Christmas.” But Christmas is anything but final. For Christians, there are constant reminders that Christmas is all about the birth of Jesus. Slogans such as “Jesus is the reason for the season” and “Wise men still seek him” appear on Christmas cards and sweatshirts and Facebook posts—reminders that it isn’t about the gifts or the decorations or the food. But I have to say this: Christmas is NOT ALL about the birth of Jesus. If Jesus had only been born, we would have nothing to celebrate. If God had come to us in the form of one of us and . . . what? Just lived and died? Lived and ascended? Lived here forever? . . . Christmas would not have the meaning it does for our lives. The celebration of Jesus’ birth is only fulfilled by the agony of his death and the glory of his resurrection. When we bask in the gentle glow of the manger scene, it is with the certain knowledge that of all babies everywhere, this baby was born to die—and not just to die but to die for us. And everything in that scene and everything in our celebration points to that certainty. o The infant sleeps in a manger because people did not make room for him. o The man will walk the road to the cross because people do not accept him. o The nighttime sky turns bright as day at the announcement of his birth. o The daytime sky will turn dark as night at the moment of his death. o His mother wraps him in swaddling cloths—a tight wrapping all around his body. o Friends will wrap his body tightly in cloth to prepare it for the grave. o Sometime in his early years, and still associated with the Christmas story, wise men bring him gifts of gold, frankincense and myrrh. o The gold is a symbol of kingship, the frankincense a symbol of priesthood, but the myrrh is a foretelling of his death. John says that Nicodemus brought a mixture of myrrh and aloes weighing about 100 pounds to be used in the preparation of the body for burial. o He is laid in a borrowed manger, which was probably a hollowed-out stone. o He will be laid in a borrowed tomb, which was probably a hollowed-out stone. Even our Christmas traditions echo the reality that this birth is also about his death. o Loving family around us reminds us that through this child’s sacrifice we become part of God’s family. o The feast we eat at Christmas reminds us of his final meal with his disciples and of the feast we will share with him forever. o Evergreens remind us of the eternal life this child will suffer to bring us. o Cutting down a tree reminds us of his cross, made from a tree, and of his life cut down. o Carrying the tree reminds us that he carried his cross. o Lights on the tree remind us that the child in the manger is the light of the world, the light that shines so that no darkness can overcome it—but the darkness will try. o Sharing with the poor reminds us that he came to earth poor, that he cared for the marginalized people of his society, and that he told us to do likewise. o Wrapping gifts reminds us that he was wrapped as an infant and again wrapped for burial. o Opening gifts reminds us that the stone was rolled away and the tomb was opened and the empty wrappings lay folded there. o Giving gifts reminds us that God has given us the best gift of all—the gift of himself. And that is why we celebrate Christmas. It’s Christmas. Make room for Jesus. In everything you do, remember the infant, remember the man, remember the sacrifice he made for us, remember his resurrection, and remember that he loves you beyond measure. Follow his light, for on this night of all nights Bethlehem is everywhere, and Christ is here, God is with us. Fear not. No longer keens among the weary trees. Before the God who wears a human form. The hush that echoes farther than the sky. Becomes the dawn of Time; the dream ignites. Will kindle yet a flame to save mankind. A child is born; tomorrow will be ours!